Specificity is one of the most important attributes of antibodies. At OriGene, we have been working hard to validate specificities of our antibodies. Figure 1. 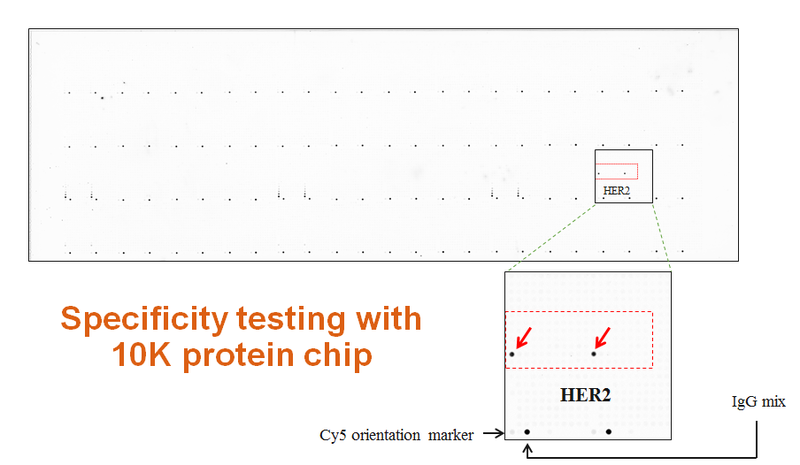 Specificity validation of anti-Her2 antibody (Cat. No. UM500036) using human Her2 overexpression cell lysates and endogenous cell line lysates. UM500036 can recognize the specific Her2 protein at predicted size (~140KDa) in overexpression cell ysate (lane 1 ) and endogenous lysates prepared from Hela, A549 and MCF7 cell lines. 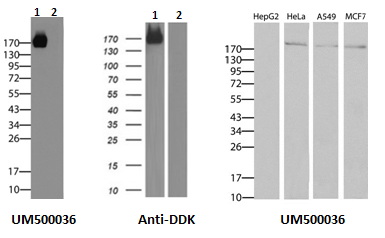 The specificity is further proved by using an independent antibody (anti-DDK antibody in the middle) against the same recombinant overexpressed Her2 protein. Figure 2. 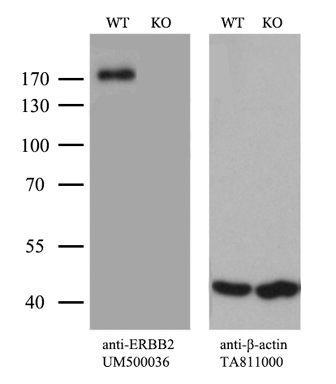 Specificity validation of anti-Her2 antibody (Cat. No. UM500036) using 10k protein chip technology. UM500036 shows no cross-reactivity with other protein on the tested protein microarray containing >10,000 overexpression lysates for different human proteins. Figure 3. Specificity validation of anti-Her2 antibody (Cat. No. UM500036) using Her2 knockout cell lysate. UM500036 recognizes the specific Her2 protein at correct size in wild type Hela cell lysate (WT lane), and shows cross-reactivity with any other protein in the double knockout cell lysates (KO lane).